The Royal Navy has long been considered this island’s first line of defence. The first royal dockyard was at Portsmouth, built by Henry Vll during the late 15th century. In 1512, his son Henry Vlll decided to build two new dockyards on the River Thames. Deptford and Woolwich were chosen because they were close to his palace at Greenwich. It is recorded that Henry visited the dockyards to see shipbuilding in progress. The first ship built at Woolwich was the Henry Grace a Dieu, and a full list of all the ships made at Woolwich is available on the Kent History Forum website. 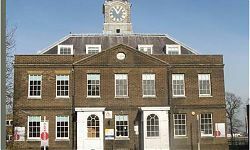 Having recently visited the Royal Deptford Dockyard I decided to visit Woolwich. There is still surprisingly much to see of the original dockyards although disappointing that there are no information boards for such an historically important site. I started my visit at Trinity Stairs which is accessible from Warspite Road. If you visit you need to check times of the tides. 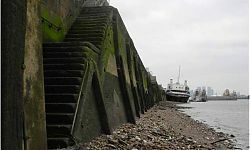 Trinity stairs and causeway was built 1831-37 and originally was a coal wharf. There is still public access to the stairs. The granite stairs are very slippery but with care you can get to the river’s shore. The cobbled stone causeway is still intact. On the western side you can see the Royal Iris Ferry: in the 1840s an old warship the HMS Warspite would have been moored in this spot. It was used to train and house poor boys 200 to 300 at a time. I did see some wood on the shore which looked as though it could have come from a ship from that period. The dockyard would have been a self-contained community of highly skilled workers. Within the dockyard would be houses for senior offices, school and churches. 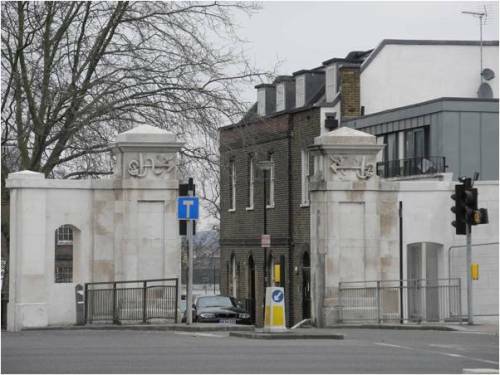 Among the buildings that form Kingside Industrial Estate you can see ones that were part of the original dockyard. 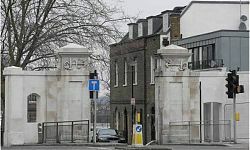 The building that is now the Co-operative Funeral Care was the dockyard school. Opposite is the original police station. The main entrance (built 1780s) is imposing and was being repaired and painted, however, apart from the rope motifs in the pillars there is nothing to indicate what they are. As you enter on the left hand side is the former Master Warder’s Lodgings and guard house. 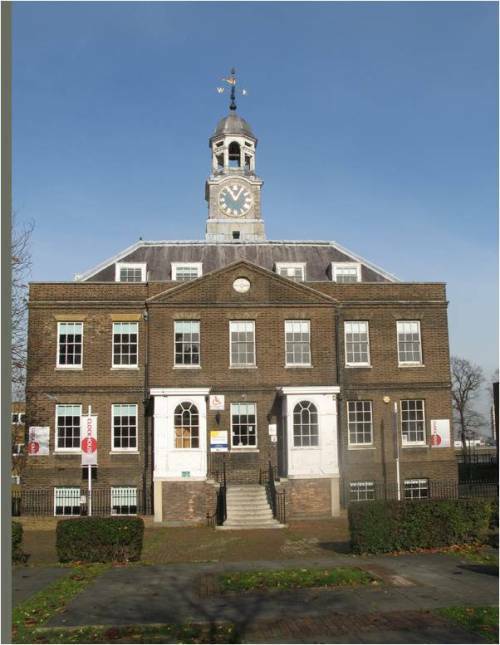 The Clock House (1783-4) is the most distinctive building and is now used as a community facility. After the Crimean War, the church of St Barnabas was built in the dockyards; the architect was Sir George Gilbert Scott. 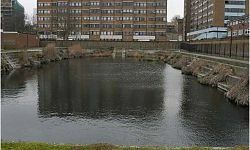 It was dismantled in 1932 and moved to the Progress Estate in Eltham. 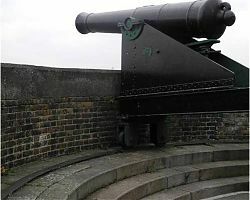 On the riverside you can still see the two formidable cannons that are the Gun Battery. There is a landing place in front of this but this was inaccessible when I visited. 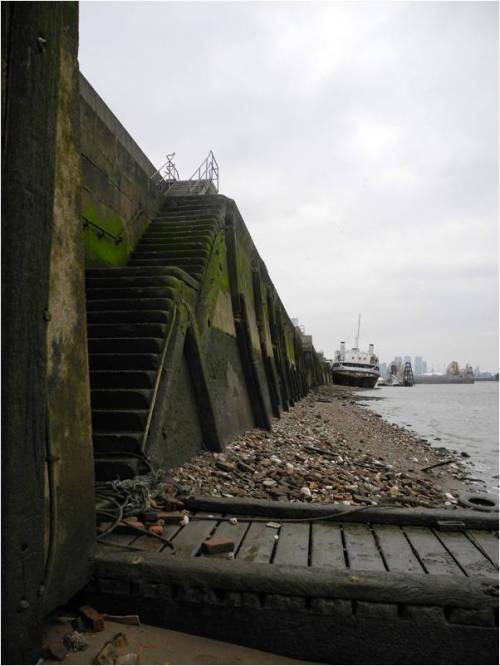 Further along the Thames Path are the two dock areas which have been filled in with water. In the absence of any information boards they could be mistaken for some strange bathing areas. The Grade II listed docks are used by a local angling club. Further along are two slip ways. After the Napoleonic Wars slip covers were introduced which were iron fabricated covers that helped the wood to season. 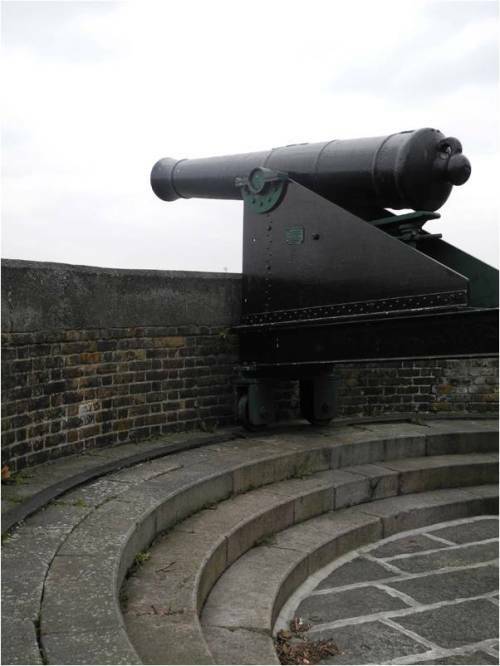 There were removed in the mid 19th century and moved to Chatham Dockyard. Since then one has been adapted and used at the Dockside Outlet Centre in Chatham. 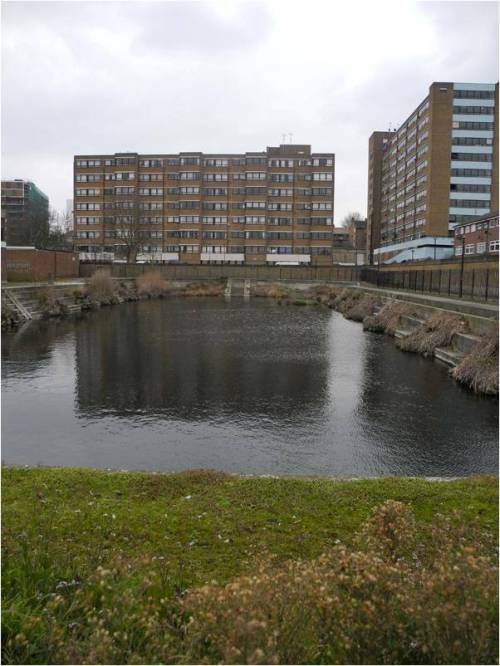 This article originally appeared on the thamesfacingeast website, click here for further information.